What Should Be Driving IoT? Where did all these IoT Subject Matter Experts come from? A few years ago, the term “IoT” didn’t even exist. (yes, I know the phrase was coined in 1999) There were a few of us that were doing Machine to Machine (M2M) stuff and before that Telemetry… and now I really date myself, Remote Data Acquisition? Now everyone is screaming IoT and trying to sell you something or services that you may or may not need. The fact of the matter is, most of what people deem as IoT is nothing new. A cloud used to be called a remote server. A “thing” was just a device connected to the internet and enterprise application integration through the internet has been going on for decades. So, what is driving IoT? Right now, I think it’s a lot of consultants looking for their next buzz (word). Remember Y2K? Strategies are how you execute a goal. IoT is not a strategy. IoT technologies can support a strategy, though… we’ll talk about that later. Anyone that has heard me speak, I always talk about the 4 goals of IoT. I know these are pretty broad and I can definitely get more descriptive, like, “Facilitate discovery of new operational processes through technology that will substantially reduce overhead”… but that’s just a $5,000 a day consultant’s way of me saying “reduce cost”. So, what should be driving IoT? Business goals! Period, end of statement. All companies have them (or should) and IoT certainly can serve a goal and help execute a strategy. You may or may not know how to execute that strategy using technology, so that’s where the real IoT experts come in… because it’s probably not an unusual goal or strategy and we’ve executed it before. If your real IoT expert or consultant is any good, he or she can name a solution in fewer technical steps than my college roommate could play “6 Degrees of Kevin Bacon”. (look it up if you don’t know what that is) Again, there is a high degree of probability, your goal, opportunity or problem is not unusual. If your IoT consultant comes calling and has a solution looking for your problem, you just went in the wrong direction. Data can have a huge impact on your goals. 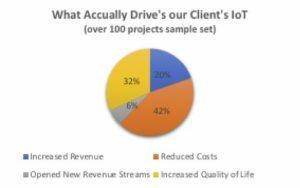 When a client wants an IoT solution developed, my first question is, why? If it doesn’t match on of the 4 main goals, I’ll advise against it. My next question is usually, who else might be interested in that data? If they don’t know… I tell them. By crowdsourcing anonymized data from cars on the road, a TSP can connect its vehicles to larger transportation networks, gathering traffic information, weather, road conditions and surroundings in real time. This is valuable information that municipalities, insurance companies and other organizations pay for. Telematic Service Providers can provide valuable data to dealers and service facilities, when service is due, or a diagnostic trouble code has been triggered. Dealers pay for this information and TSP’s can make commission off service calls. Car makers and tier one suppliers spend an awful lot of money on test and measurement when designing, building and redesigning. They can now get massive amounts of real customer centric data to help them design safer and more reliable parts and transportation. They reduce their overall R & D test budgets by paying for data, rather than creating and collecting it. One issue that happens in the automotive market is that cars and car parts are over engineered, driving up costs that impact margins and the end consumer. With real customer centric data, cars are now being designed for actual use case rather than the extremes that happens in the lab. 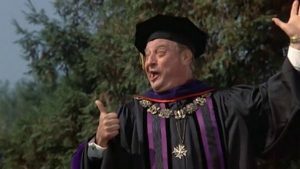 So, in closing I’d like to share a line from Thornton Melon’s (Rodney Dangerfield’s) commencement speech to Grand Lake University’s graduating class in the movie “Back to School”. In a weird way, he could be talking about IoT. You must look out for number one. You must innovate. The advantages you have today will be replaced by innovative companies, tomorrow. Don’t step in number two. There’s a lot of buzz. There are a lot of so called experts who talk a lot about IoT and the benefits… then there are those who can do it. It’s rough out there. Don’t spend a billion dollars (or any amount money for that matter) to learn the hard way. Find the right IoT expert who can not only talk through the goals, but can technically prove your concept, calculate ROI and then productize your solution. There’s no substitute for experience. If you are thinking of “going out into the world” of IoT, call an expert! Lab 651’s Innovation Delivered process helps you identify your business goals, addresses them with innovative technologies, turns them into quick and cost effective POCs and if ROI is substantiated, turns goals into reality. We’ve done this for hundreds of innovative clients.